Thousands of years before the construction of Upper Fort Garry and even a number of millennia before fur traders ever saw the Forks of the Red and Assiniboine, Indigenous peoples had been visiting and trading at the site and assembling for excursions throughout the prairies and parkland. It was a crossroads in the movement of people, culture and resources throughout the western half of the North American interior. The fur trade posts that would later spring up at the site during the competitive years of the fur trade, and ultimately the construction of Upper Fort Garry, would reflect the geographical importance of a location astride two major river routes. It has also been a place where the histories of Native and non-Native peoples have intersected. While the Ojibwa maintained the closest connection to European traders there, Cree and Assiniboine peoples also harvested the resources of the region. In the early years of the Red River Settlement, ties remained strong between Chief Peguis, his people, and the HBC and early settlers. The Selkirk Treaty of 1817 was tangible proof of the respect and good relations between the Ojibwa, the Cree and the arriving Scottish settlers. Allied with the settlers and the HBC against the North West Company, the Ojibwa maintained close links with the company at the Forks, even after the merger of 1821. 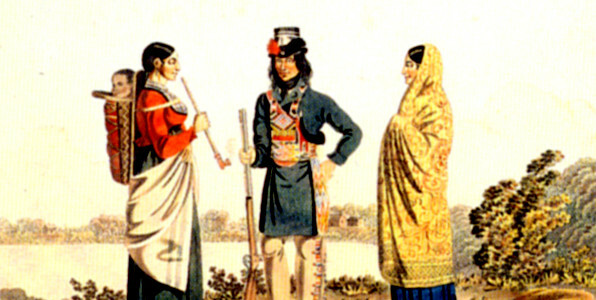 As time went on, however, the privileged relationship between the Ojibwa and the HBC deteriorated as the terms of the original treaty were ignored by the Euro-Canadian traders at Upper Fort Garry. By the early 1860s a now elderly Peguis in his “Indian Manifesto” demanded fees from those settlers who had used land beyond the two mile strip ceded in 1817. Later, he would claim the 1817 treaty to have been only a temporary agreement between the two parties. In pressing the issue of land rights, Peguis demonstrated that he grasped the full implications of the coming influx of white settlement in the West. Despite these ill-feelings, the Ojibwa, now settled at the northern tip of the settlement, visited the Upper Fort on a regular basis, both for trade and to meet with incoming groups. The arrival of Dakota (First Nation) peoples at the Upper Fort in December of 1863, chased from American territory after the Minnesota wars, caused fear among the locals over the potential for warfare among the Dakota, Ojibwa, and Metis who had been enemies for generations. Despite these misgivings, and one or two incidents of violence, no large scale warfare erupted. In the events of 1869-70, remembering their longstanding alliance with the HBC at the Forks and mindful of the coming changes in the Northwest, the Ojibwa, now led by Peguis’ son Mis-koo-kenew (Christian name Henry Prince), refused to side with Riel and the Metis. But as political power shifted from Manitoba to Ottawa, the Ojibwa became further alienated from the centre of the settlement. Prince signed Treaty 1 in 1871, along with Indigenous leaders of the Swampy Cree who had immigrated to the settlement from communities to the north. Some four decades later, the onetime allies of the first settlers would be swindled of their rich farmland at St. Peters and pushed onto the poor land of their present Interlake reserve. As the old settlement became a suburban community, its one-time inhabitants, First Nations peoples, were pushed to the geographical and cultural margins of the developing West.